Triad Area HOA Management Company, Association Management Group, Adds Team Members | Company Newsroom of Association Management Group, Inc.
November 24, 2015	(Press Release) - AMG, Association Management Group, one of the Carolinas' largest professional homeowner association managers with five offices in North and South Carolina, recently added three new staff members to its Greensboro, NC office. Dayla Maddox, Melissa Cook and Tyanna Waddell have joined AMG's community management team, a group of seasoned managers with an average of 10 years in the industry; some with more than 20 years of association management expertise. Maddox, Cook and Waddell will work with Triad communities to help their volunteer boards organize and conduct board meetings; prepare budgets and funding reserves; draft assessment collection policies and procedures; create, implement and enforce rules and governing documents; collect delinquent payments, prepare financial statements and reporting methods and operations; evaluate risk management and insurance programs; implement maintenance programs; prepare bid requests and identify key contract provisions; and recruit, select and manage personnel. According to AMG founder and President, Paul Mengert, the three new associates are a perfect fit for the company because of their empathy, diligence, customer service skills and expertise in project facilitation. 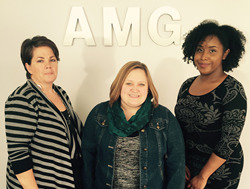 "AMG is continually looking for the best and brightest to join our corporate family," he said. "Over the last two decades, AMG has built a nationally-accredited team of community managers based on its ability to identify not only the right skills but the right attitudes to serve its clients. An important part of AMG's role is to link our clients with experts who can help them improve the operational efficiency of their communities and, ultimately, increase property values. We look forward to Dayla, Melissa and Tyanna providing our hallmark personal service to clients and helping communities stay healthy, attractive and connected."